With today’s changing technology, implants have become a great choice for replacement of missing teeth. In the past, bridges and partials were what replaced those teeth, but the problem is that bridges can be difficult to clean underneath and partials are removable so they sometimes begin to flop around. Also, when partial or bridges are placed, patients lose bone in these areas and things begin to not fit so well. 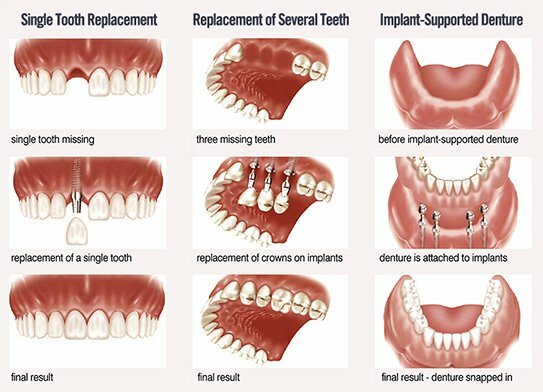 Now, when someone has a missing tooth, or even several missing teeth, implants become a great option, and they can be used for single crowns, bridges, or even full dentures. Some of the great benefits to having an implant(s) placed are that the procedure is relatively pain free, and there is very minimal, if any swelling afterwards. Implants also help to preserve bone because they imitate a real tooth, serving as a root in the bone. Many times when a patient chooses to have an implant placed, their dentist refers them to an oral surgeon for placement of the implant and possible bone grafting, and then the patient has to go back to their general dentist and sometimes a lab to have the implant restored. The great thing about having an implant placed here at West County Dental is that I am able to bone graft, place implants, and restore them to their finished product, all here in our office.